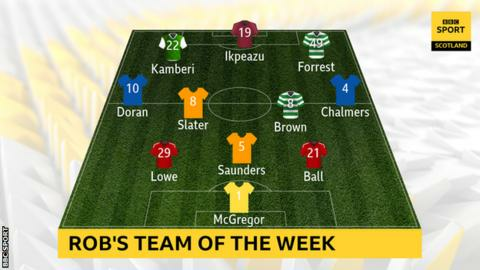 Who made Rob Maclean's team of the week? Formation 3-4-3: Allan McGregor (Rangers); Dom Ball (Aberdeen), Steven Saunders (Partick Thistle), Max Lowe (Aberdeen); Joe Chalmers (Inverness Caledonian Thistle), Craig Slater (Partick Thistle), Scott Brown (Celtic), Aaron Doran (Inverness Caledonian Thistle); James Forrest (Celtic), Florian Kamberi (Hibernian), Uche Ikpeazu (Hear of Midlothian). It wasn't really a Scottish Cup weekend when goalkeepers grabbed the headlines but Allan McGregor produced a really sharp second-half save at Pittodrie to deny Aberdeen's Andy Considine. It probably kept Rangers alive in the competition and heading for a replay at Ibrox. The Aberdeen fans would have been worried about the absence of regular right-back Shay Logan against livewire Rangers winger Ryan Kent, but stand-in Dom Ball can be pleased with his performance. The hosts switched off for Joe Worrall's Pittodrie equaliser but, that apart, they defended well. The Partick Thistle defence was under constant bombardment from Hearts in the first half at Firhill on Monday night and it was a minor miracle that that they only conceded one goal. The Championship strugglers' impressive resilience, with centre back Steven Saunders at the heart of it, laid the foundations for a rousing second-half comeback. Aberdeen have done well to extend Max Lowe's loan spell from Derby County, initially for six months, into a season-long deal. The former England Under-20 left-back has power, pace and presence and was again an eye-catcher with his classy contribution on Sunday. It's taken a while for Joe Chalmers to score his first goal of the season but it was well worth the wait as he curled in a lovely left-footer for the Inverness opener against Dundee United on Sunday. He also hit the bar and and, generally, made a sizeable contribution to a richly-deserved 2-1 win. After eschewing transfer interest from Australia in favour of a new contract, captain Scott Brown is very much back in business as the driving force in Celtic's chase for a third straight domestic treble. Three goals in his last six games, including a well-taken rocket in Saturday's win over Hibernian, are a big bonus but it's his massive influence on everything that happens around him that's central to Celtic's success. A touch of top quality from Partick Thistle midfielder Craig Slater 18 minutes from time earned the Jags a replay at Tynecastle. With the outside of his right foot, he delivered a perfect ball across the face of the Hearts goal for Christie Elliott to tap in a rapturously-received equaliser. Long-serving Inverness midfielder Aaron Doran was already man of the match on Sunday before stooping to head in a stoppage-time winner against Dundee United. The little Irishman, a Scottish Cup winner with the Highlanders four years ago, was involved in all that was good about the Caley Thistle performance at Tannadice and there was plenty of it. The first of the Scottish Cup quarter finals needed something special to bring it to life and James Forrest was happy to supply that moment of magic. The Hibs-Celtic tie had failed to live up to its big match billing for the first hour. Then Forrest ripped a right-foot strike past Ofir Marciano for his 15th goal of the season. Flo Kamberi was the one Hibs player who looked as if he might do some damage to Neil Lennon's Celtic in Leith. Too many of his team-mates let a big opportunity pass them by. That's not a criticism that can be levelled at the Swiss, who put in a great shift even though it ended in defeat. Target man Uche Ikpeazu caused chaos in the Thistle ranks as Hearts laid siege to the home defence. His two right-foot flicks of the ball over Jags defenders followed by a left-foot volley which fizzed just wide very nearly delivered a goal-of-the-season contender. Alex McLeish's second stint as Scotland head coach is over after 12 games and just five wins. But what other figures lie behind that run of results? After an unhappy 14 months, pockmarked by bitterness and rancour and suspicion, Alex McLeish's reign as Scotland head coach comes to an inevitable end. BBC Scotland's Alasdair Lamont charts how Alex McLeish's second stint as Scotland head coach unravelled. Twelve clubs, five matches each, with titles to be won, European places to be clinched, and relegation to try and escape. But what will the key issues be? Bournemouth's Scotland international winger Ryan Fraser talks about Arsenal speculation, being kicked at Aberdeen and how a dog called Maisie is the secret to his success. Arbroath winger Danny Denholm opens up on the League One title win in his latest BBC Sport column.